Since Uber Eats came about, not a lot of people have seen the light of day. And as we are slowly becoming cave dwellers, we thought of taking it back to our roots with some home-cooked rice and curry, feeling the warmth of Lankan-style flavours at the very least. Since we might actually turn to dust if we surfaced in daylight, Tiffinbox was a promising option and it really turned out to be one of our better decisions considering how they delivered – yes, literally and figuratively. Tiffinbox turned out to be an interesting one as it is a 100% solo project; a one-man show in every sense of the word. Its Founder, Chef, delivery boy, and everything else Madhuka Weerasekara is an obviously energetic man who just seemed to simply love cooking. 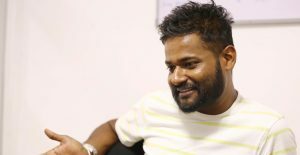 Having started the business just a month ago, Weerasekara said he chose to start this venture not only because everyone who had tried his food were almost always impressed and it just felt like the natural thing to do, but also because – while there’s a multitude of cafés and bistros in and around Colombo – he wanted to contribute something different. “This is the type of food I love to cook, but of course there’s an element of filling a gap in market demand. I think people are looking for a good rice and curry place and I hope we’re it,” he shared. Cooking his 93-year-old grandma’s recipes in his own home kitchen, everything is done meticulously – ensuring hygiene, no added MSG at all, and shopping on the regular, purchasing the meats and vegetables himself to ensure the quality and freshness of his product. 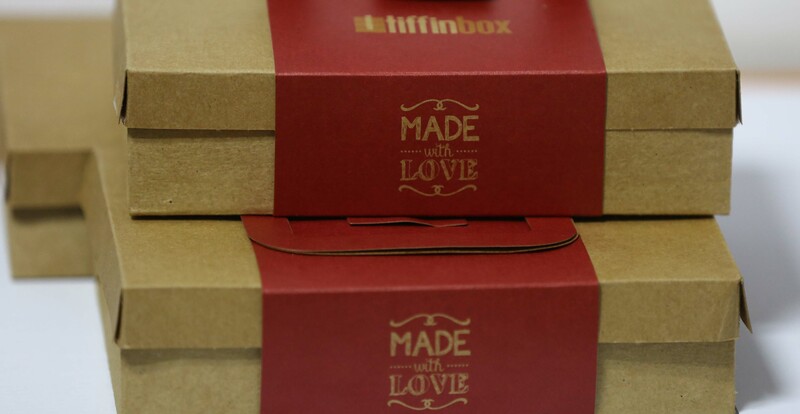 Tiffinbox meals also come in very cool packaging that also happens to be eco-friendly disposable material, without the use of any polythene. Much like the yellow rice, you get a fried egg alongside brinjal moju and potato salad. Normal rice comes with four vegetables in addition to the meat option. On Tuesdays, you have the option of tempered dried fish or tempered dried sprats for the same price. The white rice used is always keeri samba. If you want to get the yellow rice option with your choice of meat item, you will get tempered potatoes, brinjal, and a fried egg. 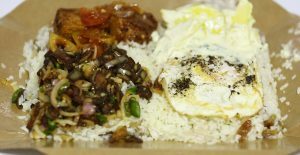 The food was overall pretty good, the rice was cooked just right, and Weerasekara appears to be an expert at balancing spices as the blend of spices and herbs was near-perfect. If we were to gripe a little, however, it would be about the potato salad, which was a little too sweet for our tastes and lacked that balance of citrus which is always lovely in a salad. Regardless, the meats were wonderful – the chicken was tender and spicy and the devilled fish had the perfect crunch to it. 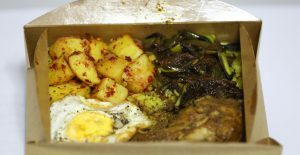 We had a great time eating from Tiffinbox, so much so that we recommended it to a few colleagues who also followed up and got their lunch fix. The menu always changes, so Tiffinbox can be your go-to spot on the daily and it will not get old or boring. 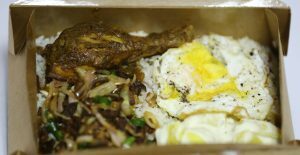 Tiffinbox will be available on Uber Eats after Avurudu. You can order through Facebook and Instagram or by calling on 076 1233344. Since its initiation in 2011, V-Day provides a platform to host interviews, discussions, and conversations on gender-based and intimate partner violence in Sri Lanka.